What better way to get all your spices for cooking than to grow them yourself! Herbs can be planted from seeds, or more easily from starter plants purchased at the garden center. They’ll grow in just about any kind of container, and provide the perfect backdrop for the fruit trees you planted this spring. Our favorites are rosemary, sage, thyme, tarragon, fennel, anise, oregano, and of course, a California favorite, cilantro. Most of them can produce several harvests. With rosemary, for example, simply clip off a stem, strip the lower part of the leaves, and root in a glass of water. When ready, plant back into the soil and you’ll have year-long taste and aroma. Rosemary, thyme and oregano are all perennials. You’ll find yourself foregoing the dried herbs for the amazingly diverse flavors of the fresh. They will enliven even the simplest of dishes, and as their taste is so much more robust than dried herbs, your children will develop a natural craving for fresh, healthy foods. And in these economic times, growing your own herbs is a positive impact on your purse! Oregano is not only a useful and usual addition to any herb garden, it also makes a wonderfully easy-to-grow houseplant! While it is still small, place it in a sunny window in well-drained soil and watch it grow! 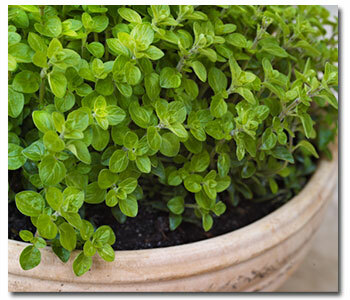 Not a fussy plant, oregano does fine in average soil, and will tolerate dry soil conditions. In fact, a native of the Mediterranean region, it is perfectly capable of withstanding droughts. The leaves of the tarragon herb are glossy, narrow, and spear-shaped with smooth edges, and are used, along with the stems, in cooking. Its flavor is sweet with a hint of anise, and while a potent herb, often used in making flavored vinegars and oils, scrambled eggs with fresh tarragon are “a bit of heaven.” The predominant flavor in béarnaise sauce, tarragon also complements fish, soup and grilled meats. This gardener wouldn’t think of preparing lemon chicken sauté without including fresh chopped tarragon! French tarragon (as opposed to Russian tarragon, which is far more mild and bitter in taste) is a sterile plant, therefore cannot be grown from seeds. When you are creating your herb garden this spring, this is one plant that will need to be purchased. To ensure fresh tarragon all year round, chop the leaves, place them in small plastic freezer bags, and press to remove excess air before sealing and freezing. This marvelous herb (which originated in the Far East, was brought to Europe a mere five hundred years ago, and embraced by Canadian and Native American Indian tribes as well as by French chefs), will prove to be an aromatic augmentation to your herb garden. If you have ever eaten a savory lamb chop, a rosemary-enhanced spaghetti sauce, or grilled seafood on skewers made of the leaf-stripped stems of the rosemary plant, you already understand why it was named the Herb of the Year in 2000, and why nearly every kitchen, no matter how sophisticated or how simplistic, has, at the least, a bottle of rosemary leaves as part of its arsenal. It is one of the easiest plants to grow, in just about any USDA zone, as long as in the colder regions it is brought indoors to winter, given strong southern light, well-draining alkaline soil, and not too much water. If grown outdoors, this amazing herb may be planted in a raised bed, or in containers and pots which will make the move inside easier. We lucky gardeners in the south enjoy rosemary as a perennial that provides us with fresh taste year-round. One of our favorite songs features in its title one of our favorite herbs. With its subtle, dry aroma and slightly minty flavor, thyme is a common seasoning used in cooking poultry and stuffing, fish sauces, and chowders and soups. It complements lamb and veal, is equally delicious in egg dishes, and enhances tomato-based sauces. Thyme is one of the easiest herbs to grow; it prefers lean conditions, with plenty of sun, as you would expect from a native of the Mediterranean region. With over a hundred known varieties and classifications of thyme (such as upright, creeping, shrub-like, English or French thyme, garden or wild), the ways you can incorporate it into your garden are only as limited as your imagination. Often used as a ground cover, it’s also great as an edger; trailing varieties bring aroma and texture to container gardens. This hardy evergreen is a perennial in USDA zones 5 to 9+, but gardeners in colder regions can winter them inside and enjoy fresh herbs all year round. Is it cilantro or is it coriander? Well, actually it’s both. Cilantro refers to the leaves of the plant, and coriander references the seeds. This gentle little herb with lacy, fern-like leaves is a social creature, requiring other plants growing around it to aid in holding it up on its spindly stems that can reach 2+ feet in height; excellent companion plants are caraway, anise and dill. An annual, this native of Asia and the Mediterranean regions prefers full to partial sun. In ideal conditions, cilantro (leaves) will last about 8 to 10 weeks before flowering. To ensure such conditions (this herb is not a friend of weeds), mulch to keep the roots cool and weed-free. Once the herb flowers, producing a delicate white to lavender display, seeds will form; harvest them immediately upon the leaves and flowers having turned brown, but prior to the seeds dispersing. To do this, cut the entire plant and hang it to dry upside down in paper bags. Occasionally shake the bags to thresh the seeds, but be certain that they have fully dried; coriander seeds can be bitter if only partially dry. Once you have harvested the dried seeds, roast them in a frying pan over low to medium heat, frequently shaking the pan. Cool, then crush with a mortar and pestle just before use; this will release the flavor, and the trademark lemon-scented odor. The wise herb gardener will retain some of the seeds prior to drying for replanting every few weeks to guarantee a continuous supply. The citrusy tang of cilantro has become a popular addition to Mexican cuisine, while Chinese, Thai, and Indonesian cuisines use both cilantro and coriander. Thai curries incorporate the chopped leaves of cilantro, while Indian curry powders owe their aromatic quality to ground coriander.